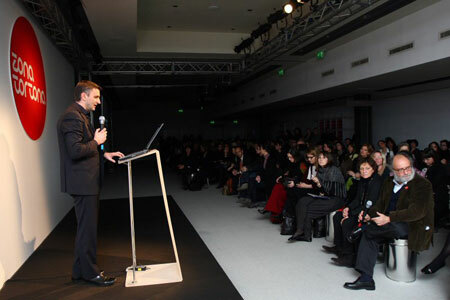 Milan, 12 February 2009 – As ZonaTortona Design continues its extraordinary growth trajectory, a number of innovative creative initiatives and a new ten-point Manifesto ensure that this pioneering design event remains a worldwide leader. “ZonaTortona Design is the only event of its kind with such truly international status,” Maurizio Ribotti, CEO of DesignPartners, the company which curates and manages the event comments. “Over 70% of our visitors come from abroad because they see this as the essential annual reference for innovation in design. This year we are introducing our Manifesto to ensure that ZonaTortona continues to evolve as an international and avant-garde nexus for the exchange of ideas in the world of design.” ZonaTortona Design’s expansion has been a consistent theme in the eight years since the event began, with an average annual growth rate of 16%. In 2008 the event attracted more than 200 clients, 1,000 journalists and 88,000 visitors. All indications for 2009 are suggesting this trajectory will continue. ZonaTortona Design is also expanding physically, moving into ZonaRomana with locations including the Spazio Botta, with its generously dimensioned lofts in a typical Milanese townhouse and the Franco Parenti theatre, which has recently been upgraded by architect Michele De Lucchi. Valcucine’s exhibition route has been divided into autonomous yet interdependent spaces which, as well as presenting new products, have the aim of defining the company’s identity in a non-exhaustive way. Visitors will have the opportunity of realising that it is possible to reconcile aesthetics and ethics; compromise between innovation and tradition; trust in technology and stimulate creativity; produce functional, comfortable and original objects while guaranteeing environmental protection. The assistance of artists such as ArteDeisa in the ARTEMATICA VITRUM ARTE programme, shown here in three different versions, and Ugo Nespolo in the new ARTEMATICA AMPHIMAS programme, has the aim of showing that creative passion and handicraft techniques can blend to recover the priceless value of manual ability. This new wood finish of Amphimas has a very chunky appearance: an even texture that allows continuous horizontal grain alignment. Ugo Nespolo drawings come to life on the door surfaces and on the table thanks to the inlay technique, a symbol of the recovery of an authentic tradition for which the patient hand of man is still essential. A cabinet for the living room is also available with this artistic customisation, designed to create clean, tidy and simply elegant environments. Revolutionary ideas can be born from a commitment to environmental sustainability, such as the Riciclantica door (the first 2 mm thick glass door ever to be produced, selected by the ADI – Industrial Design Association – Index 2007), the honeycombed aluminium bookcase (8 mm thick) or, yet again, the new base unit entirely in glass designed to eliminate double side panels and finally reach the objective of a fully-recyclable kitchen. Not only do the materials used guarantee resistance and durability, they are also completely recyclable and non-toxic, while the reduction of volumes reaches the boundary of dematerialisation for clean, tidy and minimalist environments. Collaboration with the Polytechnic of Milan, with Alessandro Mendini and with Alessi further witnesses to Italian genius that becomes excellence.